Messaging is made simple with this stylish dispenser. 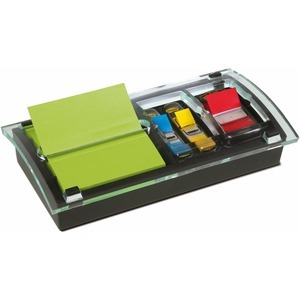 Dispenser holds 3" x 3" Pop-up Notes and 1" and 1/2" Post-it Flags and is weighted, allowing one-handed dispensing. It's a great way to keep notes and flags at your fingertips. Dispenser comes with a pad of Post-it Notes and 1" Post-it Flags. It holds 100 notes and 50 flags. The paper in Post-it Notes is sourced from certified, renewable and responsibly managed forests.